Alliteration is accessible to all! Okay I’m done. Start some science! Really done this time. Today’s double post covers the smallest of stars, still larger than most planets, and the only weather Mercury will ever have. Humans are naturally interested in the extremes, the biggest, smallest, fastest, hottest, coldest, and every other characteristic outlier. With stars, being so huge and powerful, we are often more interested in the largest, hottest, and most energetic. Though on the opposite end of the spectrum, Cambridge University astronomers have discovered the smallest star in the known universe. 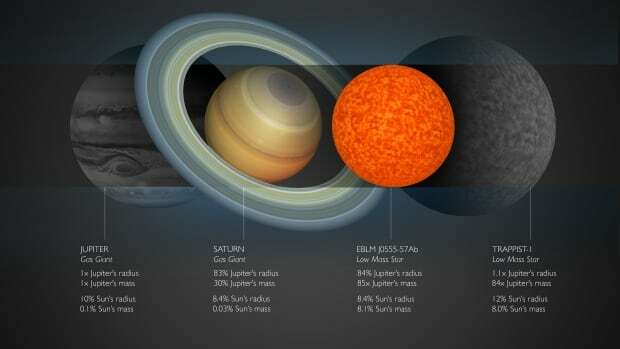 The star, a red dwarf, has the endearing name EBLM J0555-57Ab, but we’ll just call it ‘Tiny.’ Tiny is roughly the same size as Saturn, which is very small for a star that is fusing hydrogen in its core, especially when considering the Sun (a median sized star) is about 1000 times larger. Stars this small can certainly have planets, as proven by two famous examples in TRAPPIST-1 with five small planets and Proxima Centauri with a single planet. Both are red dwarfs and both have planets in their respective habitable zones. But even though Tiny is the smallest known star, by virtue of being a star it is extremely heavy, weighing in at a whopping 85x the mass of Jupiter! This is what makes it a star, the extreme gravity that ignites Hydrogen fusion in the core. It’s the density that matters when forming stars, not the mass, and in most cases not the size (the caveat is that if a planet is big enough it will inevitably have enough mass to ignite fusion, then shrink down to a smaller size). Tiny was so small that astronomers originally thought it was a planet, orbiting a much larger star. It was certainly the right size to be a planet. However, because it was gravitationally bound to another star, it’s mass could be calculated, and this was the smoking gun, proving that Tiny could only be a star, making it part of a binary system, where two stars orbit their mutual centre of gravity. Studying stars at the smallest end help us understand the characteristics of entire galaxies and even the universe. The mass of small stars may pale in comparison to more massive giant stars, but there are far more small ones, meaning they make up more of the universe’s visible mass. And finding the smallest stars and largest planets helps us to determine how they form, and where the boundary lies. Is Tiny the smallest? It’s certainly close to the theoretical minimum size for a star. Come a bit closer to home, and drop down a level in scale, to the solar system. Let’s talk about Mercury. Boring, small, dry, extreme temperature, no atmosphere Mercury. It may be less boring that you think. Mercury has massive temperature swings between day and night, around 400 C.
Mercury’s south polar region, with craters that never experience direct sunlight, are thought to be a haven for this water. Comets that orbit close to the Sun are constantly shedding ice and gases, and provide a source for this water. Let’s look a bit closer at point 3. Comets lose trails of debris as they orbit the Sun, providing dust for the meteor showers we see on Earth. But with Mercury much closer to the Sun, meteor showers are much more common there. Furthermore, without an atmosphere, these ‘meteors’ reach the surface easily as micrometeorites. Except Mercury actually does have an atmosphere, called an exosphere, which is built from this cometary debris as it collides with the planet. How is the exosphere shaped by this debris? Is it similar to Earth’s atmosphere, relatively homogeneous around the planet? It turns out the answer is no. Observations from the MESSENGER spacecraft in orbit of Mercury showed that micrometeorite dust came disproportionately from the Dawn-leading side of the planet, creating a lopsided exosphere on Mercury. It makes sense since most comets orbit the Sun in retrograde, opposite the direction of the planets, leaving their dust trails to come in and hit the planets at a higher speed than if they were orbiting in the same direction. Still, not all comets produce dust trails moving fast enough to produce the observed bombardment of micrometeorites. Researchers from NASA’s Goddard Space Flight Center showed that two particular populations of comets, Jupiter-family and Halley-type, produced dust with the speed necessary to match the observations. Other comets and asteroids don’t have the right orbits to leave behind dust that travels fast enough, and so they don’t contribute to Mercury’s exosphere. All of this means that Mercury has a much more complex environment than originally thought. It seems we’ve underestimated the boring rocks of the solar system, the Moon being another example, thinking they are just quiet and unchanging. Yet the more we learn about them, the more we find that they can harbour water, undergo seasonal changes, and hold secrets of the dynamic and fascinating solar system we live in.